Is the iPad Douglas Adams’ “Hitchhiker’s Guide to the Galaxy”? I recently read (and retweeted) the tweet above. It made me think what has been achieved in a relatively short space of time (30 years or so, since computers began to reach the public, initially in only a very rudimentary form), and inspired me to develop those thoughts. 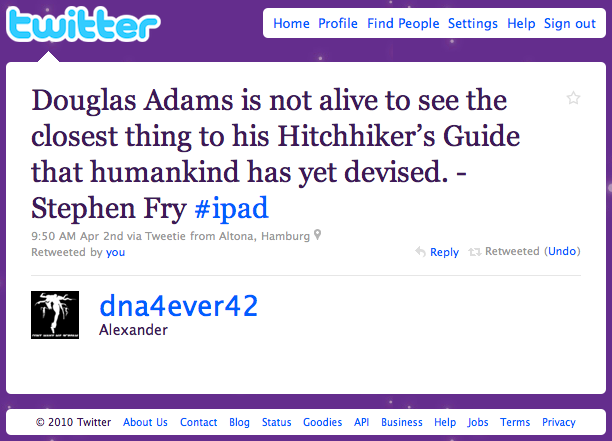 As @dna4ever42‘s tweet quotes Stephen Fry (in the Time magazine article ‘The iPad Launch: Can Steve Jobs Do It Again?‘), Stephen Fry (@stephenfry) likens the iPad to the encyclopedia in Douglas Adams’ brilliant ‘The Hitchhiker’s Guide to the Galaxy‘ (the encyclopedia being that guide), written by Adams, a close friend of Fry, in 1979. It is indeed a shame that Adams, who Fry describes as being the first person in the UK to own an Apple Macintosh computer, isn’t able to see the iPad (Adams died of a heart attack at the age of 49 on 11 May 2001) – one can be fairly sure that he would have been excited by it. Some commentators say that after the agricultural and industrial ages, we are now in the information age. That may be true – information is everywhere, to the extent that we are almost drowning in it. Websites, blogs, podcasts, webcasts, etc. And that’s only online – on top there are newspapers, books, DVDs, videos, records, tapes, and live performances (unrecorded, and lost forever except in the memories of those present?). Google, and others, are trying to help people search through the world’s information, including now also the information previously not available online. As part of its goal to help people search through the world’s information Google is digitizing ‘old media’ content so that it can also be searched (Google Books’ Library Project and Partner Program).